After five years of anticipation, 10,000 early adopters will finally put SEPTA Key to the test. Monday marks the launch of an initial pilot program on Philadelphia's buses, trolleys, subways and the Norristown High Speed Line. 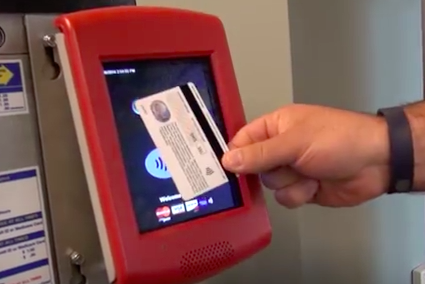 The first step will involve the sale of new contactless fare cards available at 12 subway stations and SEPTA's headquarters at 1234 Market Street. On Monday, riders will be able to purchase the cards in the form of a Weekly or Daily Transpass that will be valid for travel on all routes included in the soft launch. Monthly passes will be available beginning with the next cycle on June 20. "SEPTA Key will bring long-needed upgrades to the Authority's fare payment and collection system," said Board Chairman Pasquale T. Deon Sr. "We're excited to share this project with our riders through the Early Adopter program." Beginning at 5:30 a.m. Monday, early adopters will be able to use SEPTA's new touch screen kiosks to select a fare type and pay using either cash or credit. Old tokens can also be exchanged using a coin slot at the kiosks. To expedite the payment process, cash customers can enter bills with greater ease than we typically find in a vending machine — no required bill orientation and less of a crumple-sensitive system. The unveiling of SEPTA's $140.6 million initiative comes after multiple delays that have been attributed, at various points, to the technical implementation of the program's infrastructure. In total, SEPTA Key will encompass 1,850 onboard fare processors, 350 vending machines, 650 turnstiles, 550 platform validators, 300 parking payment stations, 480 handheld sales devices, 1,200 offsite card purchase locations, and 2,000 card reload locations. The initial pilot phase will feature active kiosks at the 13 stations where the cards are available for purchase. "This is a major step forward in the SEPTA Key fare modernization project," said SEPTA General Manager Jeffrey D. Knueppel. "The Early Adopter program will allow thousands of customers to begin experiencing the convenience of the SEPTA Key, while also providing valuable feedback that we can use to further enhance the customer experience moving forward." First conceived in a 2011 partnership with Xerox subsidiary ACS Transport Solutions, SEPTA Key has been held back in large part because of the ambitious scope of the initiative. To avoid glitches down the road, SEPTA is committed to programming an adaptable backend that can anticipate potential changes that may become necessary as the system's reach expands. To start, riders will be limited to using the agency's branded SEPTA Key card. In the future, however, the system will be compatible with a variety of contactless payment devices. Rather than appear at a station in person to redeem fare purchases, passholders can conveniently reload their cards online at SEPTAKey.com Once the system's user base expands, all riders will be able to use a stored value or "Travel Wallet" feature to manage SEPTA fares on a dedicated transit card. All other fare instruments will remain fully valid until SEPTA provides advanced public notice of a scheduled phase out — whether it's tokens, paper transfers, tickets and magnetic stripe passes. Philadelphia remains the final holdout city in the United States to rely on a token-based fare payment system. Given the struggles cities like Boston and Chicago had when launching their modern platforms, SEPTA's slow and steady approach may ultimately prove the wisest. Early feedback from the pilot will dictate when SEPTA is ready to expand beyond 10,000 users, possibly as early as this summer, and start activating the remainder of the new kiosks at its 53 stations. Last month, in an encouraging sign, the agency announced that SEPTA Key's rollout will broaden as 2016 progresses. No immediate timeline has been set for the Regional Rail deployment, but if the initial phase goes smoothly, it could come sooner than expected. On Monday, SEPTA officials will be on hand at the 13 pilot stations in order to help customers navigate the purchase of a new fare card. You can watch the agency's demo video below and learn more about the initiative here.